In January 1987, the first issue of the Mutual Fund Reporter, the longest running monthly newsletter of it kind, was published. At that time, there was very little information available to the public on the topic of mutual funds. 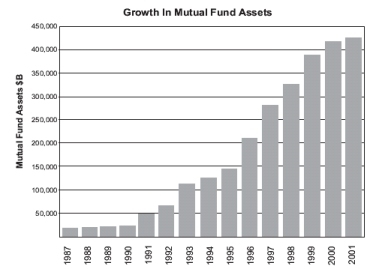 Over the past 15 years, the mutual fund industry has grown at a rapid pace. Assets have grown from $20 Billion to over $425 Billion. There is now a tremendous amount of information available about mutual funds, in the press and online. The reporting by the mutual fund companies themselves has also improved greatly. While initially our newsletter was focussed on specific mutual funds and investment ideas, it grew to cover important financial planning topics as well. Such as, whether or not you should contribute to an RRSP or pay down your mortgage, how to minimize taxes etc. In 1997, we introduced an online version of the Mutual Fund Reporter newsletter, www.mutualfundreporter.com, to complement the mailed copy. Following this introduction, we asked if readers would prefer to receive an email version of the newsletter and many of you responded favourably. Our email subscriber base has continued to grow tremendously over the last 24 months. As a result of the popularity of the online version and subscriber feedback, this month will be the last month that we mail a paper copy of the Mutual Fund Reporter newsletter. Future monthly issues will be available online and via email exclusively. This will allow us to continue to communicate our ideas about mutual fund investing, and will add benefits that are only relevant to online subscribers like our "Recommended Website of the Month". If you do not already receive the Mutual Fund Reporter newsletter via email, please subscribe online at: www.mutualfundreporter.com/subscribe, which will allow us to keep the Mutual Fund Reporter information coming to you on a regular basis. This service will continue to be offered free of charge. An important factor in our decision to discontinue the paper version of the newsletter was the introduction of the ScotiaMcLeod Exchange Newsletter. This newsletter is produced by ScotiaMcLeod and is professionally written by journalists at the Globe and Mail as well as other professionals within the firm. The exchange covers many of the topics that our independent newsletter would cover and is sent quarterly with your ScotiaMcLeod statements. The topics covered in the newsletter range from financial planning to investment ideas. We have reviewed the content of both newsletters and feel that the Exchange (pdf 1.7 Meg) newsletter covers all the relevant topics that we would also be covering and it is a more than adequate replacement for the Mutual Fund Reporter newsletter. This excellent investment update will ensure that we continue to communicate regularly with those clients who don't have email or don't require a monthly update. We will also continue to send you any specific recommendations on mutual fund holdings within your ScotiaMcLeod portfolio if changes are recommended. If at any time you would like us to review your account, please contact us at 1-800-387-9273 or by email at carl.spiess@scotiawealth.com. If you have not seen any recommendations for your holdings, it is likely that we are keeping with our buy and hold long-term strategy. Feel free to call us if you would like us to reevaluate the portfolio and how it relates to your needs and goals. This RRSP season, while generally reported to be quiet in the press, was a record year for our team at ScotiaMcLeod. New client contributions, and strong growth in the markets over the last 6 months have led us to record client asset levels. On behalf of the staff at the Mutual Fund Reporter investment team, we would like to thank you for investing with us. In February 2000, we published information on index funds. We pointed out that, while there are over 50 available from ScotiaMcLeod, we generally consider them to be higher risk than traditionally managed funds. We specifically recommended Synergy Canadian Style Management Fund, as a diversified fund that has historically outperformed the TSE 300 with slightly lower risk. We are pleased to report that the fund has continued to perform as expected and stuck with their investment strategy. Exchange Traded Funds are becoming more widely available in Canada. We have added information on the pros and cons of exchange traded funds on our index funds page. Both index funds and exchange traded funds can form a portion of your overall investment mix, and can be held in ScotiaMcLeod accounts. However, both investments should be well understood to be a part of your complete investment plan. We would be pleased to help advise on your specific situation and whether or not they are appropriate for you. For more information, please visit www.mutualfundreporter.com/indexfunds or call us at 1-800-387-9273.